1 - How did you reach 80% Poison & Acid resistances? Last edited by OnionCuter; 11-28-2017 at 08:03 AM. Last edited by k_flaathe; 11-28-2017 at 07:29 PM. Nah. It really doesn't matter that much. Hey dude sick build but may I ask why you go Ectoplasm on your ring? I feel like it's not needed at all or is there something i'm missing? 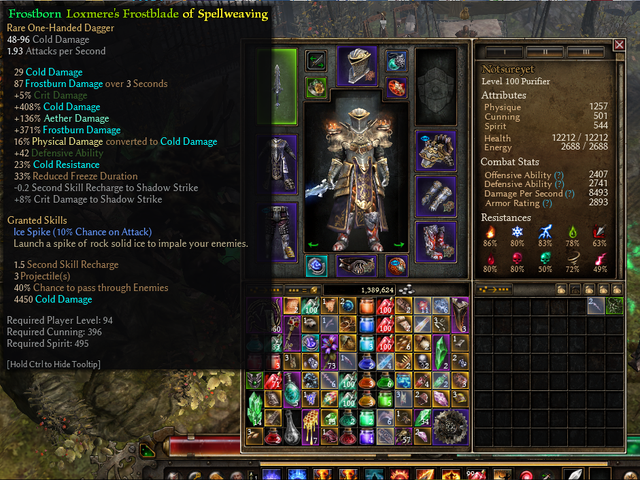 However, before I decide to level a new toon (which I hate :P) Might as well ask if this dagger good for the build? Not sure if it could roll attack speed then it would've been perfect. Does execution procs from two handed weapons? I was thinking on making a 2 handed version of it, with Soulrend and maybe some other changes. I think I saw a build like that some time ago but I can't find it. Last edited by Eddie_Alucard; 01-01-2018 at 07:22 AM. This dagger is better than any legendary you could use.